Jim Mallinder admits he will have to make some ‘tough decisions’ as Saints bid to get the balance right for this weekend’s LV= Cup semi-final at Saracens. With five key fixtures still to come in the Aviva Premiership regular season and a Champions Cup quarter-final at Clermont Auvergne also on the horizon, Mallinder knows he must shuffle his pack. 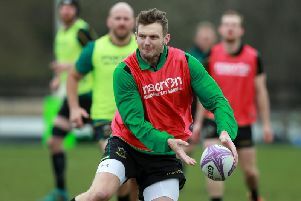 But he is desperate to make sure he picks a team capable of prevailing at Allianz Park on Saturday, with the prospect of a home final at Franklin’s Gardens eight days later an enticing one. Mallinder will assess a couple of injuries from last Saturday’s 33-33 draw at Gloucester and think long and hard about the 23-man squad he will send to Sarries. “Christian Day got a bit of a bang to his knee and the Pisis got knocks last weekend, but it was a physical game and you expect that,” said the Saints boss. “We’ll see how they are and then we need to make sure we get our selection right for the semi-final at Saracens. “We’ve got to make some tough decisions there. “We’ve always got at the back of our mind that we’ve got Premiership games and a massive European game coming up, but we’re a club that is built on winning.